In my previous post, I have discussed different ways by which you can invest in mutual funds. In this post, we will see exactly how to invest in mutual funds online through SIP in India. Many investors find it hard to get started with mutual funds online. Often they are advised to go offline for investing, which many investors find it hard and time-consuming. That is the reason many investors fail to start investing. So I decided to write this post on how to invest in mutual funds online. I would like to demonstrate this step by step procedure with an excellent mutual fund AMC, which is nothing but Franklin India Mutual Funds. The reason I chose this fund is that it offers very simple yet speedy procedure. Note that I have highlighted important points in bold for your convenience. Follow this simple DIY guide and get your mutual fund account ready in 7 minutes! Bank Details – Franklin India have tie-ups with some banks, so ensure that you have an account in these banks. You can check that here. There are 2 steps to start your SIP Online. Now let’s see each step in detail. For investing in the mutual fund, you must be KYC verified. There are several ways by which you can get yourself KYC verified. I have listed few options below. You can check your KYC status here. 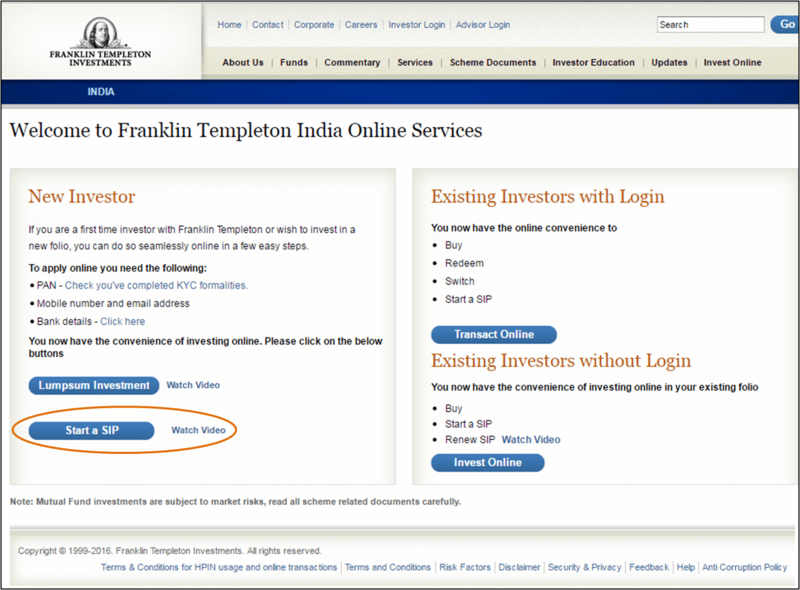 Go to Franklin Templeton India Online Services here. Go to “New Investor” section on the left side view and choose “Start a SIP,” as we want to start the SIP. Before filling out the actual form, you need to confirm few things like your KYC status; you are not from US or Canada and few more things. 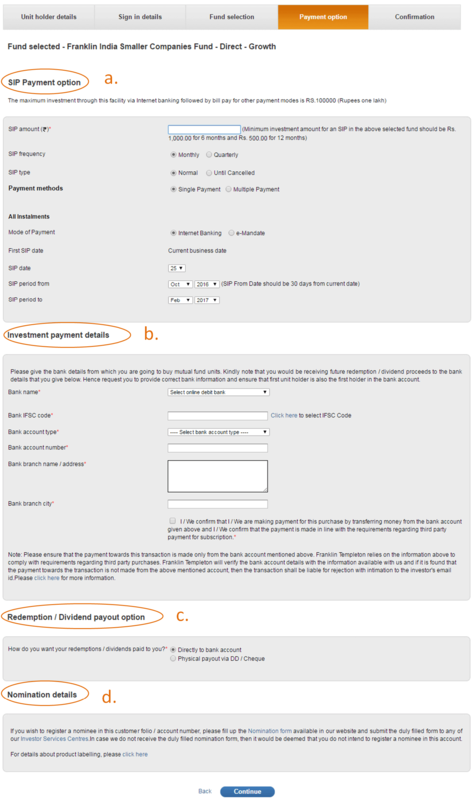 Most important here is to choose DIRECT radio button which is at the bottom section (shown in orange circle). This means that you are investing in Direct plan and there is no broker/distributor/agent between you and mutual fund AMC. You can check whether you are KYC compliant or not from the Franklin website link. 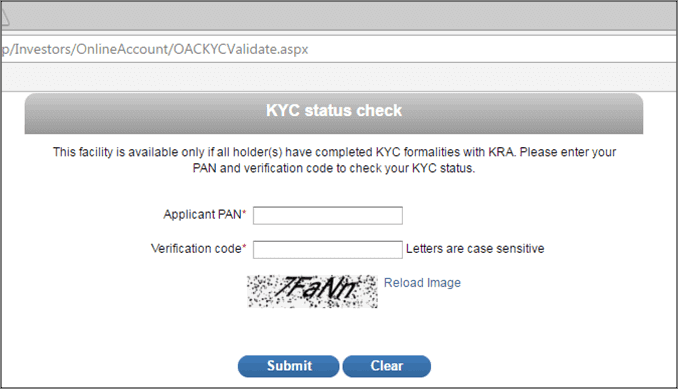 Here you need to enter your PAN number & verification code shown at the bottom on below image. There are 5 main sections where you would be filling your investment information. I have added hyperlinks to below 5 sections so that you can go to the desired section quickly. Now let’s explore each section in details. 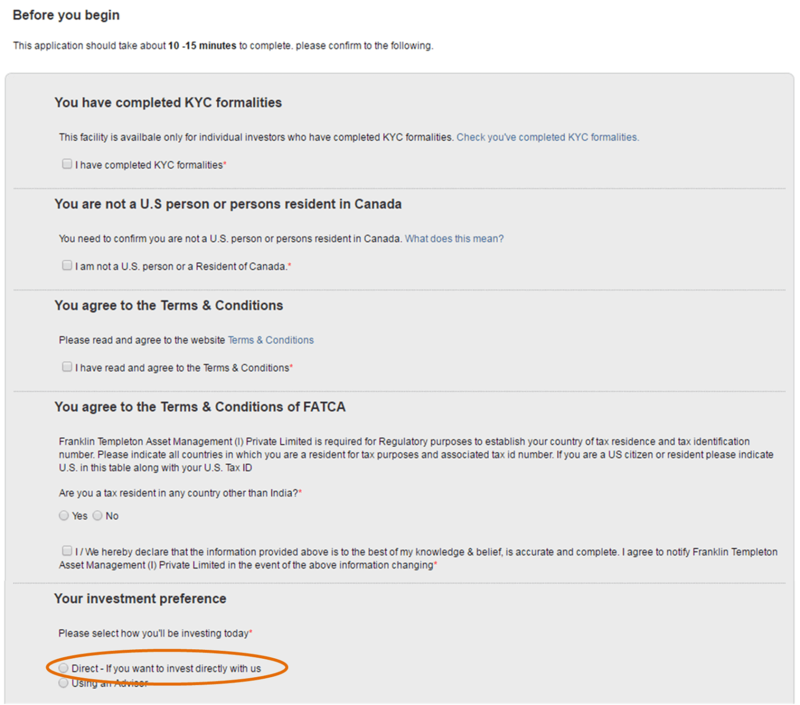 You can notice that there is another Important information required obtain FATCA/Additional know your customer (KYC) information as shown in above image. 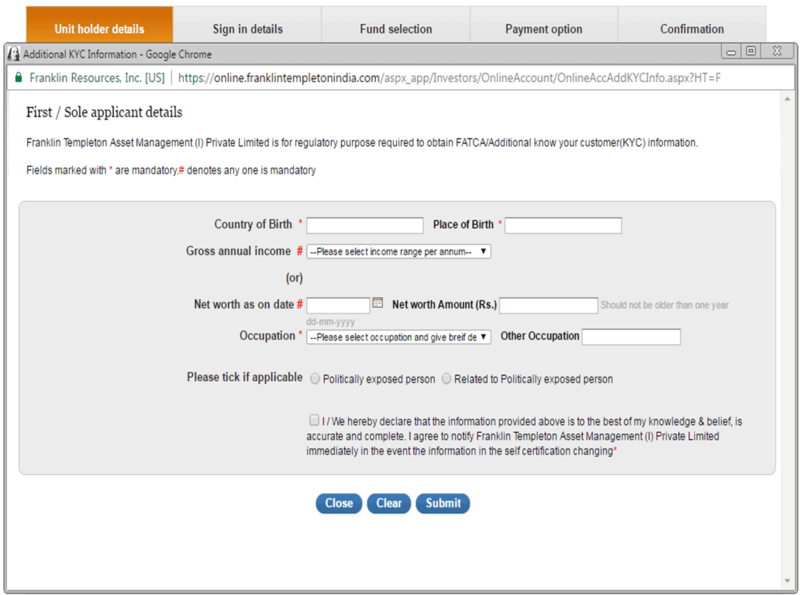 Click on “click here” link (shown in the orange circle in above image); you will be shown a pop up with necessary details that you need to declare. As shown in the First / Sole applicant details section enter your “Country of Birth“, “Place of Birth“, “Gross annual income“, “Net Worth“, “Occupation“, Make sure whether you are politically exposed or related to it if applicable. Enter your valid mobile number & email address, which you would like to use for all communication. Once you enter the mobile number and click on “Send me my OTP“, you will get SMS from Franklin with OTP that you need to enter here along with verification code shown at the bottom of the image. Once you are done with this page, click on “Continue button“. Next part is creating your sign in details. Create a Username and a good password for your account. 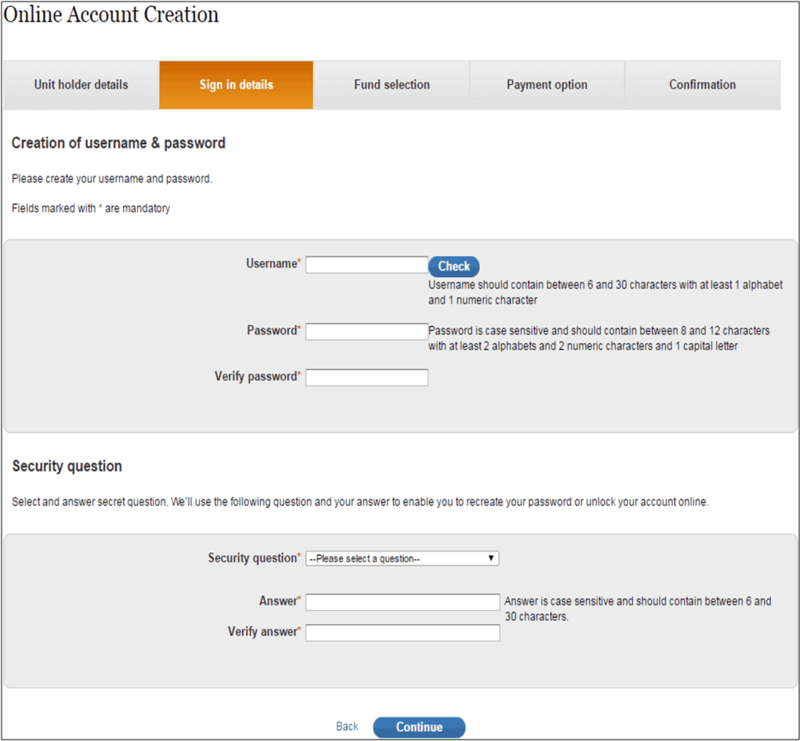 Enter the security question and its answer; this will be helpful in retrieving your account in case you forget it. So make sure to enter an answer which you will easily remember. In this step, you have to give your fund selection. As you can see, I have chosen Franklin India Smaller Companies Fund, which is currently best small cap fund. Choose any suitable category you wish to invest in. Then choose fund per your goals. I have selected Franklin India Smaller Companies Fund for the demonstration. This SIP registration can be done through your bank’s website via internet banking. Once you enter investment details, you would be directed to the net-banking section of your bank from where you have to pay for the first SIP installment; you would have to register Franklin as a biller in your bank. They have the association with many banks; you can check the list of banks here. This section defines how you want to start your SIP. Specify SIP frequency (monthly or quarterly), Payment method (Single or Multiple), Mode of Payment (Internet Banking or e-Mandate), SIP date and SIP start and end dates. Give the bank details from which you are going to buy mutual fund units. Note that you will get all your future redemption or dividends to your bank that you specify here. Hence make sure to provide correct bank details here. There is one more thing that first unit holder should also be the first holder of the bank account. Specify how you want to get your redemption or dividend payouts. You have 2 options, first is Direct to bank account & second Physical payout via DD/Cheque. I would advise you to select “Direct to bank account“, as it is the fastest method of getting your money immediately in case you need to redeem your money. If you want to register nominee for your account, you need to download the Nomination form from here and then submit the duly filled form to any of the Investor Service Centers. You can get the addresses for service centers on the website. Confirmation is the last step in starting your SIP. Here you get all the details that you have given in previous sections. Confirm that all details given by you are correct and click on Confirm button and you have just created your new mutual fund investment through SIP in Franklin India Mutual Funds. Everything Done!… You have just started your online mutual fund SIP. You will get a screen with New Portfolio number, Transaction reference number for the first transaction that you just have completed, Unique Registration Number (URN) and SIP details. Now login with your login details and see more portfolio details. In the above image, I hid some fields for obvious reasons. Furthermore, you can also do LUMP SUM investments in this account from approximately 2-3 days after account creation. Generally, I start a SIP and do lump sum transactions when I feel that market is down or whenever I have extra money with me. 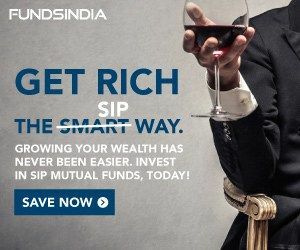 I hope you have found this Do It Yourself (DIY) guide on how to invest in mutual funds online through SIP helpful in creating your investment in mutual funds. Do let me know if you need any help from me. 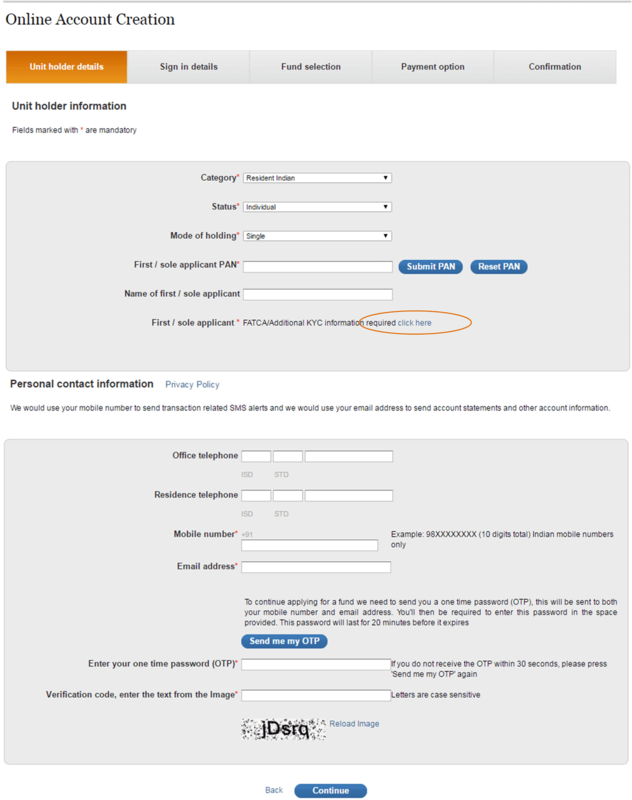 Disclaimer – I am no way connected with Franklin India Mutual Funds, and I do not get any monetary benefits from them. 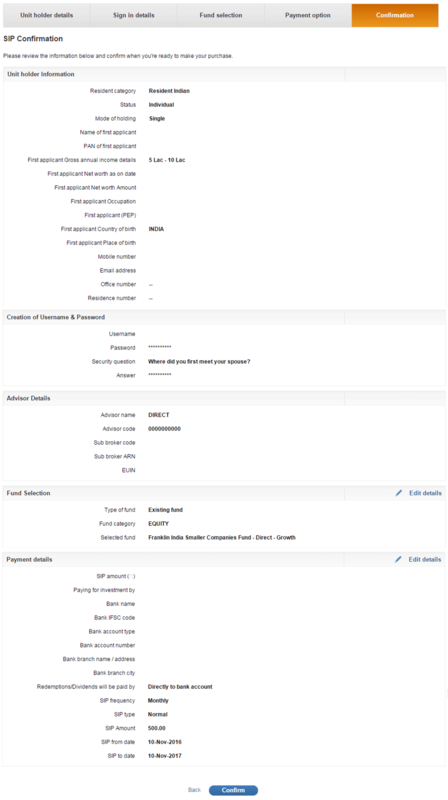 All images shown here are taken as a screenshot on my computer system from Franklin India Mutual Funds Website. This is just amazing!…Excellent… I was looking for this kind of guide since long ago…Anyone can follow and start investing in mutual fund online in SIP easily. Thanks a lot.. Thanks Meghal. Glad you liked it. Hi, just wanted to let you know that today my portfolio got created with my first SIP. So wanted to thank you for above guide on mutual fund investing online. Hey Meghal, thanks for letting me know. Glad that you got a good start. Hey, first of thanks for your work. It followed your guide and just started another SIP online. its really fast and now i dont need to go to any mutual fund company or agent. Also i have seen your another article on Direct plan and i am excited to see how much returns i will get. Hey, glad to help you! Surely Direct plan is best than regular plan. I hope you will get good returns. Let me know if you need any other help. 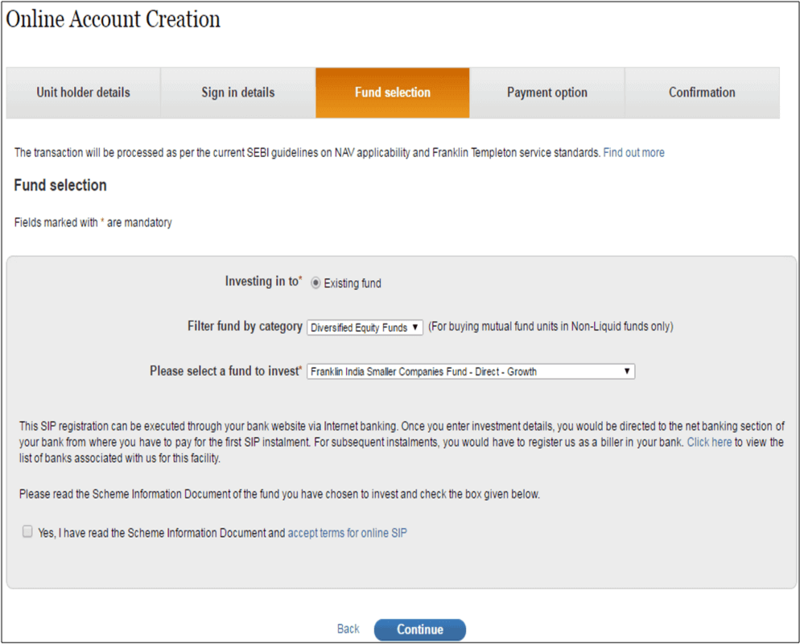 I followed this guide and completed procedure also my bank account got deducted for my first SIP installment. But i still can not see anything in my login in this mutual fund. Please help me. Have i done anything wrong. Please reply asap. Hey C T bella, can you let me know when you have completed your transaction? I completed my transactions today morning only..what could be the problem..
NAV of most of the mutual funds is calculated after closing bells of Sensex. So your mutual fund AMC will assign units based on today’s NAV by tomorrow to your account, same will be reflected to your online account by end of day tomorrow.